It’s 1664, the height of the Age of Sail. Benny “Magic” Wand is a professional chess player, a hustler, really, who immediately (within two pages!) finds himself shipped out of England and on to Jamaica in lieu of jail time after getting caught plying his trade once too often. Upon arriving in Port Royal, the “wickedest city on earth”, Benny joins the human flotsam that populates the place in the off-season, living on the beach and eating beached turtles, and, well, waiting for something to happen. The name on everyone’s lips in Port Royal is the same: Henry Morgan. When will the famous English privateer return to Jamaica? And where might his next raid against the Spanish be headed? Luckily, Morgan returns not too long after Benny arrives in Jamaica, and he immediately begins crewing up for an attack on the small town of Villahermosa, which our hero opines upon in the quoted passage above. Benny starts off at the very bottom of the barrel, a scrub boy, but soon his hard-won knowledge of tactics marks him as a useful tool for Morgan’s ongoing war in the Caribbean. The two men then start a strange friendship, one marked by rivalry over the chessboard as much as it is adventure on the high seas and back alleys of Port Royal. Robert Hough’s latest novel is fantastic, a perfect realization of swashbuckling action and tense interpersonal conflict. This shouldn’t surprise anyone too much, considering how great his last novel, Dr. Brinkley’s Tower, was. Where Dr. Brinkley had many different viewpoint characters detailing its story of unchecked capitalism running rampant over a small Mexican town, the eponymous Man Who Saved Henry Morgan, Benny, is our sole narrator of events this time out. He’s a clever and engaging companion, always trying to figure out a new angle and make a name for himself. The real mystery at the heart of the book, though, is Morgan. At times, the story recalled to me Paul Thomas Anderson’s film The Master, as it has a similar interplay between two strong personalities, one an open book to the audience and the other a cipher. In addition to the psychic war that eventually results between Wand and Morgan, Hough, like he did in Dr. Brinkley, also transmits some interesting economic ideas in the text. Hough is interested in how economies, especially those shackled to boom and bust cycles, can be hijacked by individual interests. Where Dr. Brinkley’s radio tower first brought prosperity to its small town, then chaos, revolution and confusion, the world of Port Royal is much more cyclical. Unlike the tony streets of St. Jago, where Morgan lives with other wealthy plantation owners, Benny’s environs are completely dependent on the plunder brought back from sacked Spanish holdings. When times are good, the pubs are full, the “knocking shops” are busy, and everything proceeds smoothly in the frontier economy. As the money leaches away, though, more and more men finds themselves back on the beach at Turtle Crawles, waiting for the tide to come in. It’s a kind of Great Man economic theory, albeit one that shows how precarious such cults of personalities can become, especially when the man at the top becomes more and more unhinged. I’ve been reading a lot of great Canadian historical fiction lately, between this book, Ian Weir’s Will Starling and Joseph Boyden’s The Orenda, even going as far back as Patrick de Witt’s The Sisters Brothers. While Boyden explicitly deals with Canada (well, really, the territory that would eventually be called Canada once European colonization completely takes hold), I find it interesting that Hough, Weir and de Witt are writing stories that take place outside of the country. I guess I’m kind of lumping de Witt in here unfairly, seeing as how he lives in the States now, but isn’t it just the most Canadian thing ever to excel in telling the stories of others? 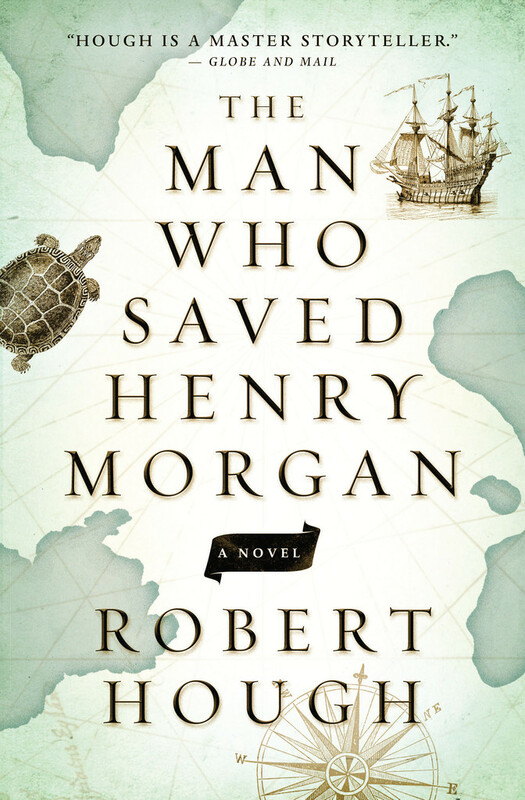 The Man Who Saved Henry Morgan is a must for fans of historical adventure yarns, especially fans of the Pirates of the Caribbean films who’re looking for something meatier, more full of well-researched detail on every page, or those who enjoyed the marketing blurb-mentioned Master and Commander, but are looking for an outlaw, unofficial narrative. But aside from that, it will also appeal to readers who’d like to see a tight little character sketch of a relationship between two men who are descended from drastically different circumstances.